Alright, alright. I realizethat most normal people post about cereal snack mixes around Christmas time, and this may seem a little bit weird to you but believe me; cereal mixes are not just for Christmas. They are for every day. Every day that you have to pack lunches for your kids, or want something a bit salty and crunch to nosh on, these mixes are the perfect thing. I ADORE this snack mix. Over the holidays I made it at LEAST 4 times and each time, we devoured the batch in a few days. It's just buttery enough, with a bit of spice, but not too salty or greasy that you feel guilty. The crunch and the flavour is just perfect. Kids will love this in their lunch, and I think it's likely FAR better for you than the pre-packed stuff that is full of artificial things and MSG. The cool thing is that you can also limit the salt, if that's an issue for you. It may seem expensive to buy all these different cereals to make the mix, but you'll have enough to make about 2-3 batches which will last for quite awhile. See, now all this talk about snack mix is a problem. It has me craving more, and now I may have to just go buy some cereal. Heat oven to 250 F. Position your racks in the middle of the oven as best you can. 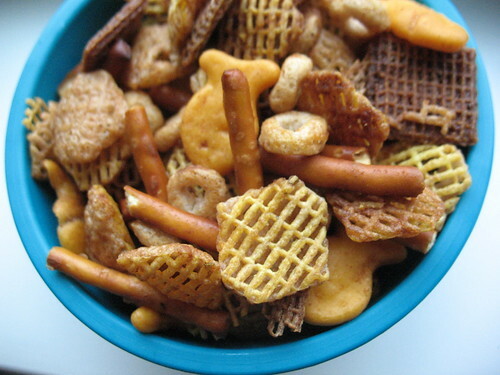 In a large bowl, toss together the Crispex, Cheerios, Shreddies, goldfish, and pretzels. Transfer them to a very large 9x13 inch baking dish, if you can. Melt the butter in a saucepan over low heat until smooth. Stir in the worcestershire sauce, garlic powder, onion powder, seasoned salt, paprika and cayenne. Drizzle the butter mixture over the cereal, tossing and mixing as you go. Try to get things evenly coated-you may even have to get in there with clean hands, tossing away. Spread the cereal out on two rimmed baking sheets and put them in the oven. The cereal needs to bake about an hour. Give them both a good stir and swap them between racks every 15 minutes. This will help the mixture to cook evenly. Once they are dry and crisp, remove them from the oven and let them cool. Store the cereal mix in an airtight container. It will last about a week or so, but I doubt you'll need to worry about it hanging around that long.